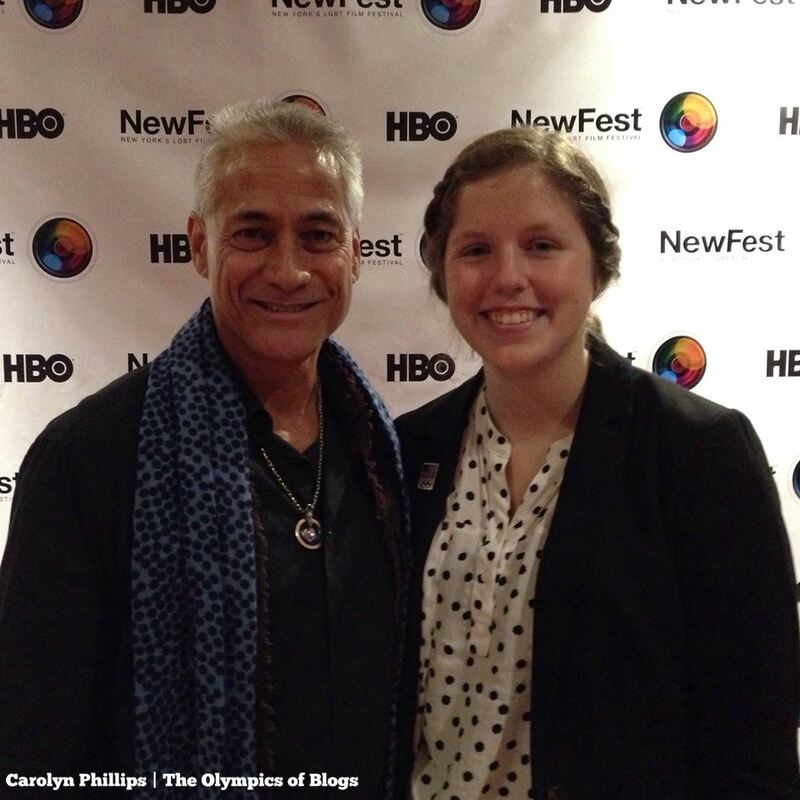 On Sunday, October 25, I traveled to the Bow Tie Cinemas in Chelsea to see NewFest’s premiere of the HBO documentary, Back on Board: Greg Louganis. Greg Louganis is one of my favorite Olympic athletes because of his true commitment to the values of the Olympic Movement. He is actually one of the reasons why I began diving. I don’t want to spoil the film, but here’s a short bio of his experience with the Olympic Movement. According to his website, he “is widely considered the greatest diver in history,” and because he won a silver medal in the 1976 Games, two gold medals (on 3 meter and 10 meter) at the 1984 Games, and two gold medals (on 3 meter and 10 meter) at the 1988 Games, I would agree. Most people remember his bravery after he hit his head on the board, continued diving within the hour, and won gold at the 1988 Games. After the 1988 Games, he retired, and then in 1995, he and Eric Marcus wrote his autobiography, Breaking the Surface, where he came out as gay and HIV+. Back on Board is about his experiences while he was competing, at the Seoul Games, after he came out, his advocacy, and his current work as a mentor for USA Diving. Incredibly, I was able to meet and interview him on the documentary, preparing for the Rio Olympics, and many other things. Below is the interview. You can watch the documentary on HBO GO and HBO NOW. The Olympics of Blogs: What do you hope people walk away with from your film? Greg: Well, you know, it’s interesting because I’m just the subject matter, and it’s the director, Cheryl Furjanic, and [producer/writer] Will Sweeney who really chose what to focus on, how to tell the story, and what story to tell. We were together for three and a half years in the process, so they really had a lot to choose from. They focused on the diving and my entry back into the sport of diving. There’s some current day stuff mixed in there as far as challenges I’ve been through and so, I think what I found people take away from it most is that no matter how much you achieve, we’re all human. We all make mistakes. We all make good decisions and bad decisions because we’re human. That’s what people come away with. It’s the humanity. It was interesting because it’s been focused on the LGBT film festival, but I’ve been getting responses from [many people]. One, which is very meaningful, was from a straight black woman, and she wrote that after viewing the documentary, she found the courage to come out to her friends and loved ones about her HIV status. She has two daughters who I’m assuming are HIV-. And [the audience will come away from it with] how challenging it is in various communities – you know, the stigma surrounding HIV/AIDS and the stigma of being LGBT. You know, all of those things. We’ve come a long way, and the advances in treatments since I was diagnosed in ’88 are wonderful. That I’m still here is truly amazing because when I was diagnosed in ’88, I didn’t think I’d see 30. Everyone was dying. Even when I saw the film for the first time, I learned a lot because in a part of the film, I said that, “An atomic bomb could have gone off, and I never would have known.” That’s how focused I was on being successful in my sport and doing my homework, getting ready, preparation, and all that. I heard about AIDS, and that was kind of out there. I had friends who were dying, and it really brought home the gravity of what was happening at that time. I find that people are coming away [from this film] with its persistence and tenacity of hanging in there and believing things will work out. The Olympics of Blogs: What are some of the differences between writing a book and being involved in this film? Greg: Well, I worked with my coauthor, Eric Marcus. We started back in ’93, and that was a whole process. I knew that I wanted to share my story, and the only way I felt that I could do it justice was through a book. Eric is incredibly thorough, and working on it was very cathartic. But at the same time, there were points in the process of our working together where I wasn’t ready emotionally to deal with it. He really forced me to revisit and examine areas of my life where I just really didn’t want to go. Eventually, I got there, and I think that was what was so telling. It was a New York Times bestseller for five weeks because it was so revealing and raw. I thought that I was sharing my weaknesses, but on book tour, I realized by sharing my weaknesses, I was actually sharing my strength. That’s kind of how I perceived this process of doing a documentary when I was approached by Cheryl Furjanic and Will Sweeney. I felt confident that I was in good hands, and my story would be treated with love and respect. The Olympics of Blogs: How did it feel to go back to diving after such a long time? Greg: It was nice. I like the capacity that I came back in as athlete mentor. That’s been so meaningful. I feel impactful. We are going to be in a tough spot in Rio. The state of diving right now globally is the entire world is chasing China. Mexico has poured millions and millions of dollars into their diving program, and it’s showing. They’re really coming onto the scene strong. Canada has a wonderful program. They know that they can’t support all of the elite athletes, so they pick and choose the athletes they feel have the best shot at success. Then they pour their resources into those athletes. It’s a very different model from what USA Diving is using. They [USA Diving] disbanded the National Training Center, which I feel is a huge mistake. I’d really like to see much more coaches’ collaboration and more of a sense of a U.S. team. I love what Canada does with their One Team campaign. Right now in the states, it’s a little bit more about this club against that club against that club. If they [the club] have a talent, their tendency is to hold onto that talent to gain recognition. It really should be a collaborative effort in order to be successful. We have some tremendous talent, but we need to share resources, especially since many of the facilities are limited. There’s not that many full on dive facilities around the country. They are few and far between. To share resources, to share knowledge, and to share experiences is the only way we’re going to be successful. Greg: David Boudia is still continuing. He gets it, which is exciting for me to see. They teamed him up. His synchro partner is Steele Johnson, who is a young kid, and he can mentor Steele through the process. Also, being teamed with a diver who is better than you elevates your performance. You rise to the occasion. I think that is very powerful and impactful. *Greg won gold for the 10 meter platforming diving at the 1984 and 1988 Olympics. In 2012, U.S. diver David Boudia won gold. I’m also going to see this event in Rio, so it was interesting to see what Greg thought about it. 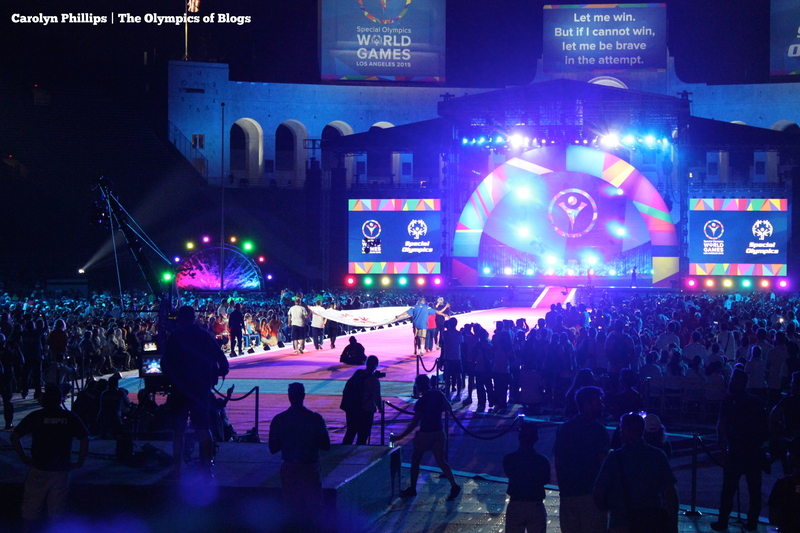 The Olympics of Blogs: How did it feel to carry the Special Olympics flag in the World Games’ Opening Ceremony? Greg: It was great. It was a great honor to be with all those guys. I had a lot of fun.